Whether your interests are to become a California Notary Public or to renew your current commission, Notaries Unlimited has the best State-approved study materials to help you successfully complete all State requirements and pass the State Notary Public Exam. and a leading edge system to prepare you to overwhelm the State exam. 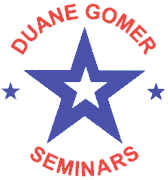 We are a division of Duane Gomer, Inc., established in 1965 and specializing in Notary Public Training & Test Preparation. Our reputation in the education field is impeccable, our passing rates are outstanding, our customer service is live and friendly, our Better Business Bureau rating is A+, and our prices are low.